Washington, NJ: Vibrating fluid bed dryers and coolers from process equipment manufacturer The Witte Co., Washington, New Jersey (www.witte.com), feature an optional motorized hoist system that automatically raises the cover and reveals the entire drying or cooling system interior to permit safe, fast, easy access for inspection, cleaning and maintenance. Operated at the push of a button, the Witte motorized hoist system replaces manual, hand-operated winches with a safer, more modern approach that enables a single worker to lift and remove the cover of the largest, heaviest fluid bed dryers and coolers, which may span upwards of 36 feet in length and top 1,000 pounds. The increased load bearing capacity further allows the entire steel conveying section to be raised and removed while attached to the cover to permit easy access to the drying or cooling pan underneath and invite clear forklift access for deck removal. Ideal for specification on large vibrating fluid bed dryers and coolers or on small capacity dryers and coolers in facilities where worker safety and machine cleanability are priorities, the Witte motorized hoist system includes two or more electric hoists with davit supports. 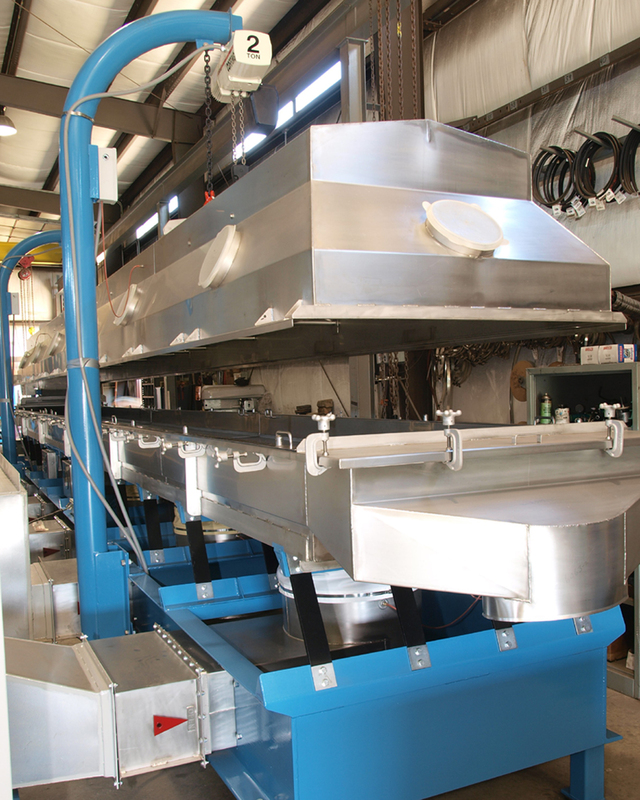 The automated system is installed during manufacture and tested prior to shipping the fluidized bed dryer or cooler. The motorized hoist system may also be retrofit on Witte drying and cooling systems in the field.